Rosacea is a common skin condition in the UK that affects nearly one in ten people. Characterised by eye problems, facial flushing, discolouration and spots, it most commonly occurs in people of middle age - though it can affect people of any age. Many of the visible symptoms of Rosacea may seem similar to those of Acne, making them easy to confuse and misdiagnose. Flushing of the face - Having hot flushes and red cheeks? This could be a sign you're suffering from Rosacea. Red Sore Cheeks - Another common sign of Rosacea is the skin of the cheeks becomes sore to the touch. Small Cyst-like Spots - Small acne like spots around the mouth and nose could also be sign you have the skin condition. Telangiectasia - This is the name given to the small vein like lines that come to the surface of the face when suffering from Rosacea. Eye Issues - Although not as common as other symptoms, in some rare cases Rosacea can cause red, gritty eyes. Sun damage - There have been a number of studies that claim a link between sun damage and the development of Rosacea in later life. Demodex Folliculorum - This is the scientific name given to a tiny species of mite that live on our skin. These mites are found in higher number on people suffering from Rosacea. Immune response - Although still unproven, there is a school of thought that believes Rosacea could be caused by a fault with the immune system. Stress - Which can be any stress, though there is particular emphasis on embarrassment and anger/rage. How can Apple Cider Vinegar help with Rosacea? ACV contains a form of natural Acetic acid which is known to help reduce the swelling associated with this condition, balancing our skin's delicate pH levels at the same time. In addition to the natural acids, apple cider vinegar is also packed with trace minerals, vitamins and enzymes that help to set it apart from other commercial vinegars. 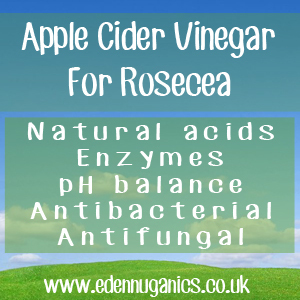 However, the most useful benefit of ACV when treating Rosacea is the way it can disinfect skin due to its unique anti-bacterial action. There are many great reasons to include apple cider vinegar in your daily diet and once you try this great tasting drink you'll never look back. The first thing to do when preparing our morning ACV tonic is to warm some water. This water mustn't get too hot as this risks damaging the enzymes found in the raw ACV. Once the water in the pan is warm, it is time to add a natural sweetener. Some of our favourites include Agave syrup, Manuka honey and Black strap Molasses. It's best to add the sweetener at this stage as the heat helps it to mix with the water. Now its time to add our high quality, raw apple cider vinegar. Around two tablespoons is all that's needed, meaning one bottle will last up to three months of daily use. Stir, sit back and enjoy! This amazing health tonic will not only help to clear Rosacea, but also offer minerals and vitamins essential for a healthy body. For this treatment we need to dilute the apple cider vinegar down with water, making a 50 - 50 solution. A secret ingredient can now be added in the form of witch hazel. Witch hazel helps to cleanse our skin and pores, helping to reduce visible signs of acne and Rosacea. Add the mixture to an air tight bottle, as once made this can be stored in the refrigerator for up to two weeks. Using a clean flannel, apply the apple cider vinegar mixture to your face, making sure not to rub hard as this can irritate the skin. Once all affected areas are covered, it is best to allow the apple cider vinegar to dry naturally on the skin, this takes around 5 minutes. This treatment can be repeated daily until symptoms improve.